This particular ball holds a special place in my heart and while I know that sounds corny, it actually does. 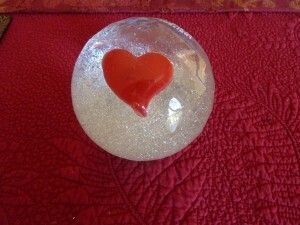 I found this ball last year and purchased it because it was sparkly and went along with the February theme since it had a heart inside. At the time, we were really working with Andrew on his bouncing skills. We tried all sorts of things but he just really didn’t care about bouncing a ball. He used to barely look at the ball when tossing or catching with me. (*See note below) Of course, I didn’t give up on this and knew that eventually I would find something that would let me know either that he was not able developmentally to bounce and catch a ball yet or he could do it and just didn’t see the purpose in doing so. While setting up one of My Obstacle Courses, I took the ball and bounced it to see how it worked because it was a bit heavier than the other plastic balls we’d used so I wanted to experience what he would experience with it. I bounced it and the heart flashed! I was beyond happy because Andrew is a huge fan of lights, always has been and probably always will be. I kept this light up heart a secret and when he showed very little enthusiasm for bouncing the ball I told him that if he did it he would be surprised, but that he had to bounce it. I showed him how he needed to do this because I had to bounce it pretty hard to get the heart to light up. He saw this and his eyes opened wide and right then and there he bounced the ball AND caught it multiple times in order to get the heart to flash. His bounces and catches were not perfect but I was not going for perfection. I wanted to see if he was able to push down for the bounce, use his hands together to catch all while tracking the ball down and up with his eyes – so much to do for something that comes easily to so many! Even if he hadn’t been able to do it, I had found something that would have motivated him to at least try. He wanted to see the light flashing and would do whatever it took to get it to happen, even if mom had to help out!! Note: I attended a brain conference which gave me some insight into why children don’t look or focus on things like this and it has to do with convergence of vision, which can produce the appearance of multiple or blurred objects. I think this was part of his issue since I don’t think he would have chosen to have balls thrown into him. I realize how frustrating it must be to not be able to really focus on something and we worked to provide ways to help him. This got better as he did more cross patterning activities like crawling, running, swimming and monkey bars, all of which helped his brain develop. When choosing this as a station activity, I knew that he was close to being able to bounce and catch and having knowledge about this, had he not been there, I would have chosen to do something like rolling it back and forth.